The other is Ernest. (Cue Ray Liotta voice) Ever since I was a kid I always wanted to be a person who watched silly slapstick perpetrated by a wrinkly dude with the best voice to hit big and small screens since James Earl Jones. (/Ray Liotta voice) Whenever I feel blue (sometimes green or red) I stick on an Ernest film and my mood melts away. His unabashed positivity in spite of his unending stupidity drives me on and on, forever. You are truly missed, Jim Varney, knowhutimean?. 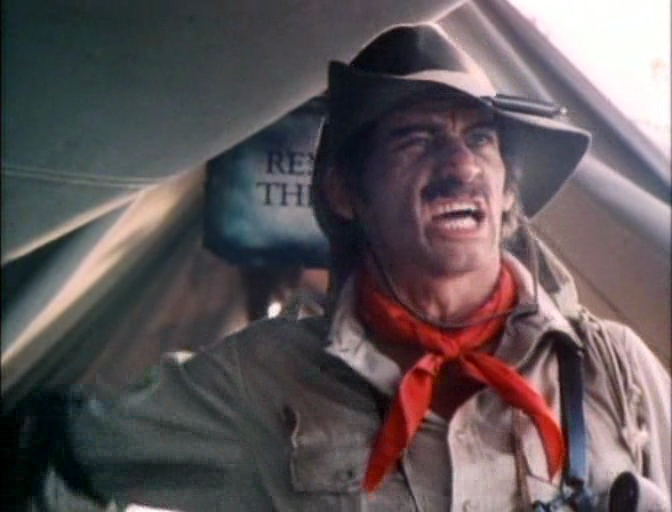 So, Dr. Otto And The Riddle Of The Gloom Beam then, this was pitched to me as the ultra rare first Ernest movie which, while Ernest P. Worrell certainly makes an appearance, it most certainly is not. 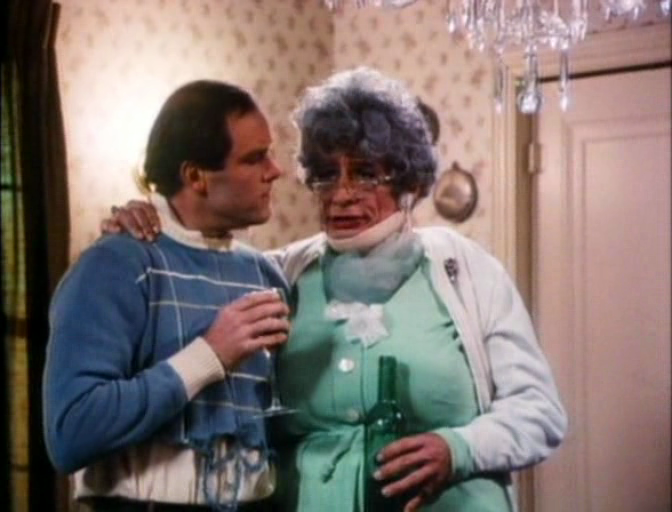 It is however an introduction to other Jim Varney characters who pop up from time to time. My favourite had always been when Varney would put on a neck brace, a cardigan and call himself Auntie Nelda, always pining for her dead son, Heimy (“a tired old woman with a dead son, who is no longer alive…”). It doesn’t sound too funny, but I assure you, it is. A plot then? Well, the story is your bare bones comedy vehicle type story: Varney plays Dr. Otto Von Schnick-ick-ick, an evil genius with an extra hand growing out of his head and a penchant for destroying the world because his parents were such shits. Otto detonates some sort of recession-bomb (timely, huh?) in Cincinnati, and the head honchos of the banking world call in Lance Sterling, a bumbling idiot hero type, and his secretary, clearly the brains of the outfit, to solve the riddle of where Schnick’s hideout is and save the day. 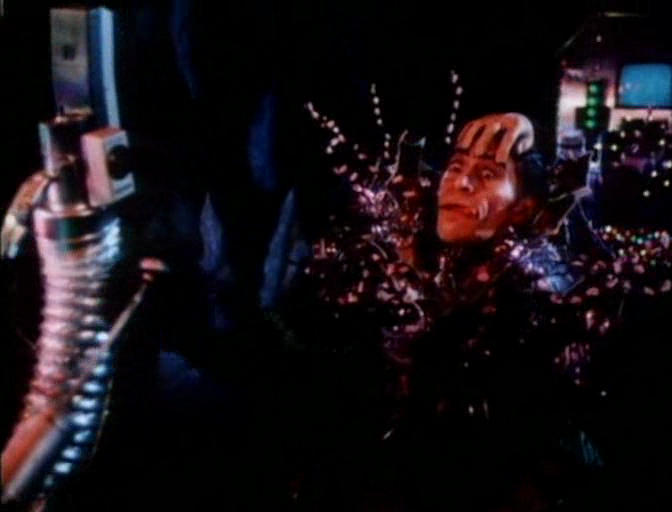 Then Doc Otto uses his “changing coffin” to assume other identities to trap Sterling, his mortal enemy, who attended the same school as him and was way more popular. It actually sounds super complicated when you spell it out, and if I were a child instead of this hulking mass of manhood, I would surely have a hard time trying to figure out who was who and what the heck was happening. Acting is hit and miss for all except Varney, meaning you wish you had missed their scenes and you kind of want to hit them in the face. The script is 40% Inspector Gadget, 40% on point wit, 20% I don’t get the reference. I guess this is a kids movie, but again I would struggle with getting references and jokes. Dr. Otto contains all your usual kiddie gross out stuff, because we all know that kids love gross stuff. You’ve got eyeballs in the bouillabaisse, you’ve got the anti-Pee Wee’s Playhouse HQ, but there are some pretty dark spots in here too. The scene where they all play Russian roulette, for instance, or Doc Otto’s parents wishing he would run away. And there is tonnes of cleavage. The most revealing cleavage I have ever witnessed in a kids film since Taylor Wayne in Wanna-Be’s: Teenie Edition (Oh, wait…). Can i get a 'honk honk'? Obviously, the only reason anyone is watching Dr. Otto And The Long Title Of Yawn I Am Bored Of Typing is to see Ernest. 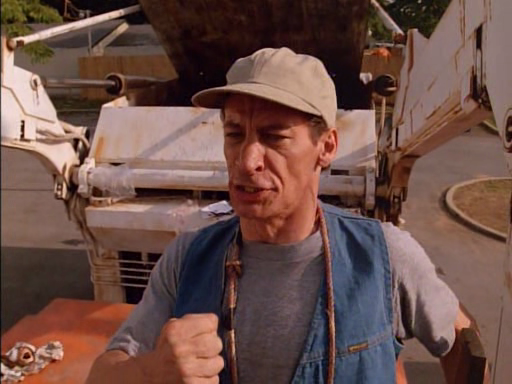 Jim Varney plays Ernest for a brief, and confusing, pre-amble and then he pops up again at the end. The rest of Varney’s screentime is split between the evil and vaguely European Dr. Otto himself, the wonderful Auntie Nelda, Aussie tough guy Rudd Hardtact, chameleon loving pirate Lightning Jack, and arrogant rich fop Guy Dandy, all of which are a joy to behold. Slave Willie, Otto’s robot helper, is excellent too and his meltdown is just hilarious. He seems to be a distant relative of Douglas Adams’ Marvin, and wears boxer shorts throughout the entire movie. It is impossible not to get infuriated with Lance though, the dude is an absolute idiot with no redeeming features, who loves to recite the pledge of allegiance for fun. I loved this movie on the base “I love Ernest” level, if you like Varney and his characters then you will love this movie. Or if you like silly cluttered pseudo-kid movies from the 80s then you will probably be into this too. If you can track it down, then I would recommend it, just don’t be expecting a masterpiece. It only gets a 5.5/10, but please remember that I actually loved it. This entry was posted in Film and tagged 1980's Kids Movies, Air Bud, Dr. Otto And The Riddle Of The Gloom Beam, Ernest P. Worrell. Bookmark the permalink. Hm. Never heard of this one, although Ernest Goes to Camp was definitely a mainstay in my past. Sounds intriguing, although I have a feeling your review is funnier than the actual film.